1) Both of my kids are given to fairly narrow bands of interest when it comes to reading habits, and I make no claims as to their normality (or lack thereof) relative to their peers. 2) I don’t censor my kids’ reading, ever. I figure if they can and want to read it, it’s fine by me. As a result, what I’m okay with my teens reading may not be okay with you for your teens. 3) While I used to be the primary influence over my kids’ reading choices, at this point in our lives, I’m much more likely to pick up a book they’ve brought home than the other way around. With all of that in mind, here’s a peek into our reading these days. My son is a young 13 year-old and favors fantasy and science fiction, mostly. Me: Tell me your favorite series or author, right now. Him: Rick Riordan, definitely. I know lots of people read the Percy Jackson books, but there’s a whole ‘nother series after that called Heroes of Olympus that’s really good, too. The newest one is called The House of Hades and is coming out in the fall. I’m looking forward to reading that one. Me: Aren’t these books for kids a little younger than you? Him: Not really; I mean, I think I started reading them a while back, but they’re recommended for middle-schoolers, I think. And I reread these ones a lot because they’re kind of great. Good stories, plus some nerdy science stuff and a lot of mythology thrown in to keep it interesting. Him: Oh! I also really like the Septimus Heap series by Angie Sage. That’s maybe even a little bit younger, but they’re really good, too. And that series is done now—Fyre is the last one and it just came out a couple months ago—but she’s working on a new, related series called TodHunter Moon that’s probably going to be really good. Me: Okay, tell me what you read most recently that you loved. Him: I like pretty much everything by Gordon Korman, but Ungifted was really, really funny. It’s about a regular middle-school kid who accidentally ends up in the gifted class, and it’s told from a bunch of different points of view—every chapter starts with the character’s name and IQ, which makes it even funnier. He’s really good with making the characters seem real. I turned to my daughter, who is 15 and likes what I tend to call “extreme teen angst” books. Me: Your turn! Want to start with your favorite book? Her: My absolute favorite that I’ve reread a ton of times is Thirteen Reasons Why by Jay Asher. It’s told in an interesting way; it’s about a girl who killed herself and then this boy gets a bunch of audio tapes she recorded, so it’s her in the past, on the tapes, and him in present-day, listening to her. It’s cool. Me: Okay. What else? Who are your favorite authors right now? Her: Everything by John Green is great. The Fault in Our Stars is probably my favorite of his. Right now I’m really liking Ellen Hopkins’ books; Perfect was really good. Me: Okay, I know why you like John Green (he’s funny, he writes incredible dialogue). What do you like about Ellen Hopkins? Her: She writes in poetry. Except not. It’s free verse, I guess? It’s weird, I have to show you. [She showed me and it’s true, all of her books are written like epic poems.] It takes some getting used to and it’s kind of unique, but it grows on you. Her stuff is dark but also really… real. It wouldn’t be good for younger teens but I like her stuff a lot. Both of my kids also read quite a bit of manga, so I asked them to share their favorites. Her: My very favorite manga is the High School Debut series, but they can be sort of hard to find. That one is basically a teenage soap opera. I also really like Fruits Basket, which has a fantasy/sci-fi component in addition to having your basic silly manga romance stuff going on. Him: Well, yeah. There’s a lot of fighting. But it’s a cool story about this kid and his friends who have special powers. For my daughter and other the-many-difficulties-of-coming-of-age story fanatics, anything by Paul Zindel, though The Pigman is probably the place to start. (Coming in at a close second would be My Darling, My Hamburger.) 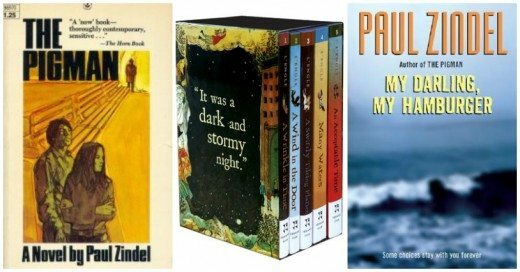 Dark and raw, Zindel’s novels definitely don’t sugarcoat the teenage experience, but I remember reading them at my daughter’s age and having trouble putting them down. 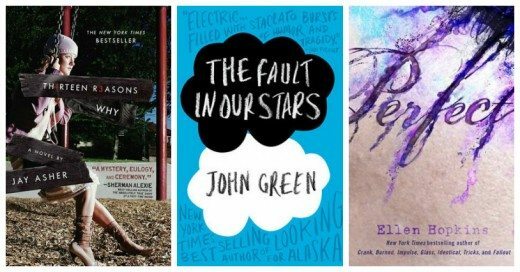 Will you share what books your teens are reading right now? To Kill a Mockingbird is my favorite book of all time. From the Mixed-Up Files. . . is my a close second. Even as an adult I can re-read that one over and over and it never gets old! Even though I’m in my upper 20s, I still have an affinity for teenage angsty books, so thanks for the reommendations! Orson Scott Card is an amazing science fiction writer (Ender’s Game). I haven’t read a book of his I didn’t like. I love to read memoirs, too. There’s something about peering into someone’s private life with permission that I find fascinating. Great memoirs are The Glass Castle by Jeannette Walls and Wasted by Marya Hornbacher. I probably would have read those as a highschooler if I was into the genre then. My son read the Ender’s Game books last year and was lukewarm about them; I wonder if perhaps he was not quite ready for them. (I’m not a big SF/fantasy fan, myself, and I loved them.) Maybe we’ll try again in a few years. I now have to go to the library and read My Darling, My Hamburger! How did I get to be 30mumblemumble years old and have such a limited repertoire in reading?! I followed my Mom there. Stephen King, who I had to take Dramamine to follow, was her favorite. As a kid, I was always very into The Babysitters Club, Sweet Valley High, etc. Then the romance novel genre happened to me and I never looked back. It hasn’t all been low-brow. I like James Patterson, too 😉 My kiddo is reading Nancy Drew right now, among others. I reread the Narnia cycle religiously. It pains me a little that my kids are not as devoted to it as I am. We read through the Narnia books together when they were still young enough for me to read to them every night, but I don’t know that either of them have gone back to the series. Siiiiigh. My 14 yo son agrees with your son on the Rick Riordan and Septimus Heap books. He says his other favorite author is Orson Scott Card. He has read all the Ender books as well as Pathfinder and Ruins. He is eagerly awaiting the 3rd book in that series. In our family now, you often can’t tell who chose a particular book (other than a few of my picks) as both my boys (14 and 17), my husband and I all read each others picks at times. My 14 year old daughter says Inkheart is her favorite. Also, The Giver and Maximum Ride. I also reread the Wrinkle in Time books ever year or two. Love them! Little House on the Prairie too. I just started rereading Anne of Green Gables last night. These books are not remotely like the ones you recommend, but I feel that everyone should read the James Herriot veterinarian books, beginning with All Creatures Great and Small. It was a different time, so along with the animal stories there’s lots of drinking, but they’re such great books that I don’t even mind those parts. I read all the books out loud to my son when he was 9 or 10. Now that he’s almost 14, he hardly wants to read at all. I hope he gets over that. It breaks my heart. Oh!! Kristie, I loved the James Herriot books as a kid! What a great recommendation. I don’t know if I could get my son to read them, but I bet my daughter would like them. Thanks for the reminder; I hadn’t thought about those books in years. Glad to hear you enjoyed them, too. I still have the hardback copies my parents gave me for Christmas when I was a kid. I just picked up a copy of All Creatures Great and Small at the library book sale yesterday to give away to any friend I might find who hasn’t read them yet. : ) Here’s another good young teen book. http://www.goodreads.com/book/show/11387515-wonder My son actually read this one (and so did I), and it’s the summer reading book this year for his middle school. Oh man, my grandparents had/have those books at their house, and when I was a kid, I read them every time I was there visiting. Such great memories! I too love James Herriot! The stories always had me laughing until I cried. Meghann, the James Herriot books mentioned upthread might be good for her. Lemony Snicket, maybe? The Anybodies, The Mysterious Benedict Society—both are series—are also really good (maybe she’s already read them). And while not particularly “advanced,” another of my favorite wayback-machine recommendations are the Great Brain books. We haven’t done Lemony Snicket, and it is a series, so it should keep her occupied for a week. Heh. Thanks for the recommendation, Daisy! That looks right up her alley, and I hadn’t heard of him. I did just remember she is reading through the series ‘The Warriors” which is about cats. I need to get a hold of more of those books, too. A good strategy for precocious readers in general is to give them non-fiction. If you can get her started reading about a subject she’s interested in, you’ll never run out of books. So for example, since she likes the Little House books, she might like other books about pioneer life. That might segue into books about US history at the time, etc. A librarian can probably help you with specific books they have available. These may seem super old-school nowadays, but I always loved The Baby-Sitters Club Series. They’re not very long, but there are a million of them & they’re written from different baby-sitters POVs (one book might be written in Kristy’s voice, another is Stacy’s…I always liked Claudia). Anyway, these books may be considered totally lame, but I always liked them. Your daughter will probably zip through them, but hopefully since there are so many, it would keep her occupied for a while. Or the Sweet Valley series?? For some reason that does remind me that I blew through a ton of The Bobbsey Twins books at her age, too. Wonder if she’d go for those? If she likes the Little House books, she might like the Anne of Green Gables books. They’re a big longer and written for a slightly older audience, but still very accessible for a younger audience. The Trixie Belden series! They are mysteries, but they are awesome. Also, Agatha Christie, although some are a little bloody. And if she’s suggestible a few might be nightmare-inducing. Is there is series of chapter books based on sports for my smart yet ESPN crazed 7 year old son? He checks out lots on non-fictional sports books from the library but I would love to find a series with an actual fictional story to them! Sonia, my old-school choice would be anything by Matt Christopher, but they may be kind of dated, now. I remember reading them as a kid. Fred Bowen has a Sports Stories series of books that get good reviews and are more current. Hope that helps! 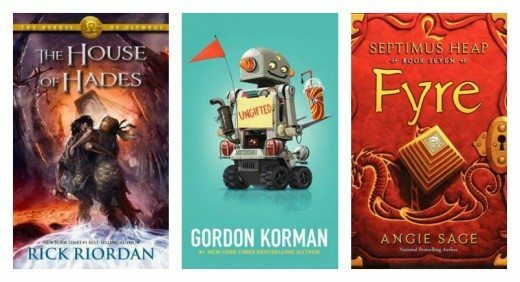 Not exactly sports related, though one of the main characters is VERY into sports is ‘The Macdonald Hall’ series by Gordon Korman. Middle school librarian here. Your kids have great taste in books, Mir. I could go on and on about the wonderful books, fiction and nonfiction, published for kids these days. Many popular adult authors also write for kids – James Patterson, for example. Check out my book blog for more recommendations, or find me on GoodReads. Sonia, check out titles by Mike Lupica and John Feinstein. My 14 year old daughter recommends the inheritance cycle by Christopher Paolini, The Belgariad series by David Eddings (one of my favorites growing up), Bloody Jack series by L.A. Meyer. All of these are action/adventure/dragons/middle earth type books. Also loves Artemis Fowl, Warrior cats, and anything by Tamora Pierce. Andrea reads anything and everything, but these are the first series that come to mind. Ooh, I love Gordon Korman! I Want to Go Home is one of the greatest kids books, and his MacDonald Hall series is fantastic. I hardly ever hear about him on these lists, so I’m thrilled Monkey likes him! Your son might really like the Wheel of Time series by Robert Jordan. They’ve actually broken up the books for a YA audience (since the originals are huge tomes). I always loved The Borrowers series by Mary Norton. My parents never screened anything I read. I was WAY above the average for reading skills and had an endless supply of books since Dad was a librarian. When the fall book order came in it was like Christmas! My 14 year-old just read The Fault In Our Stars in a day, after I told her I’d finished it in two days. We both really liked it and she’s moved on to Looking for Alaska. I think we’re both becoming John Green fans. She also loved Veronica Roth’s Divergent and Insurgent, and can’t wait for the 3rd book to come out in the fall. Your kids have great taste in books. Now that I’m a school librarian, I try to find time to read more. I loved 13 Reasons Why and also enjoy John Green’s books. I read Ungifted this year and it was delightful. I just found out that I won the Laura Bush Foundation grant for my school next year so I’m looking forward to buying many more interesting books. I bet Monkey would like the book “How they Croaked” that chronicles how famous people in history died. It’s fun and quirky. Ha! That sounds like it would be right up his alley—thanks for the recommendation! Neither of them have read any Gaiman yet; that’s a great recommendation. The kitchen chemistry ones sound good, too! And of course she’s already read The Perks of Being a Wallflower… it’s on my list, now, so I can read it before I finally get around to seeing the movie! So! Many! Books! 🙂 I am bookmarking this page so I can refer to it when we visit the library this summer. I want my 12 yr. old daughter to read The Giver trilogy this summer. She LOVED the Hunger Games so I think she will like these books too. Plus, The Giver has GREAT discussion points to talk about at dinner. Can I just tell y’all I keep coming back to this thread with paper and pen because MORE BOOKS.